I have been studying the Law of Attraction for many years (about 5) and I have seen improvements in my life even if things seems to come slowly and I am not sure if what I do is making any difference. I say affirmations, I meditate and I read law of attraction books and other spiritual material. Does this law really work or how can I know if I am doing it right? The Law of Attraction is a state of being not an application. It does not need to be applied. The Law of Attraction just happens! Just like the law of gravity, it just happens! You do not wake up in the morning thinking: "I better apply the law of gravity while I live on this planet, otherwise I will fly off". You do not do that, do you? No, you don't because it is unnecessary. The mere act of being on this planet allows the law of gravity to work its magic and keep things the way you experience them. The Law of Attraction works in a similar fashion. You do not need to apply the Law of Attraction for it to work. It always works! If you pay more attention to it, it does not work more. The Law of Attraction is in place the moment that you choose to experience life in a physical dimensional reality. It is part of this Universe in this sense. You are maybe focussing so much on the outcome of what you are trying to achieve that you forget that the journey is the best part of it! Your Higher Self will tell you how you can go deeper inside of you and find the Universe within, where all the Laws that you observe on the outside are contained. Your source of knowledge on these laws can come from within you, more than from outside of you. The only truth is the one within you. How does that feel? Does it make sense? Because when you say that the Law of Attraction does not work for you completely, you are saying that your life experience is not working for you completely. So, if there is something in your life experience which you do not like, then it is not because of the Law of Attraction is not working; it is because you are not in vibrational alignment with the outcome you desire. If you try harder, you are simply attempting to create an artificial state of alignment using the principles of the Law of Attraction, not the Law of Attraction. It does not work that way. The Law of Attraction is not a tool for manifestation. The Law of Attraction just is. The principles of the Law of Attraction can be manipulated by thought in many ways. They may not necessary work for you. They may simply work for those who are writing the books you are reading. Do you get this? Let's talk about finding out what tools your Higher Self has put at your disposal for you to manifest in this life experience of yours. What you are in vibrational alignment with, is attracted onto your life. Now, let's talk a bit about where and how this vibrational alignment happens and works. It is in your energy field, you carry it with you. Did you know that your energy field talks to the Universe on your behalf? You are always vibrating something or in synchrony with something you want or do not want. You are constantly responding to the stimulation of your environment. You do this by outputting thoughts and emotions that are vibrational emanations, like frequency waves. This is part of how your biology works. If you have an energetic statements in your auric field that says something like: "I am afraid", you will attract similar experiences. Experiences that will make that statement true. As a consequence, you will experience or manifest situation of fear in your life. You are hardwired to manifest the dominant energy statement of your energy field. Thankfully, in this Universe, you do not experience things in reality as soon as you think about them. There is a delay effect. Energy and focus has to be applied to sustain and uphold that feeling or thought, otherwise it will not manifest. This gives you enough time to make sure you are maintaining your energy based on thoughts and feelings you really want to experience. 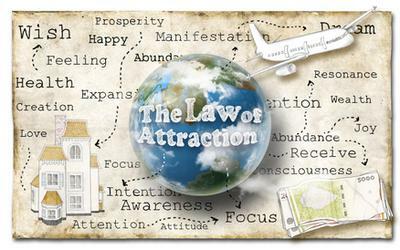 This is how the principles of the Law of Attraction work. The question is; can you use the power of your mind to override statements that not longer serve you? Yes, you can! This can be achieved through awareness and choice. You will go through an energy shift, you will feel it. It is not an intellectual endeavour, it is a full mind, body, spirit transformational process. When it happens, you cannot miss it! Without awareness and choice, you will be going around in circles. This is possibly what you are experiencing right now. It is not because the Law of Attraction is not working for you, it is because you are not aware of how your choices are affecting your life and your manifestation. Also, the Laws of the Universe work together in harmony with each other and in harmony with the creative process, of which you are part of. The law of choice and consequence, the law of gestation, the law of unity, the law of polarity, etc. When manifesting a life experience in this Universe, you cannot work with only one Law and ignore the others. This can be very liming, do you see that? Are you in alignment with what you choose? Meditate on this and find the alignment within you. It is this alignment that will move you in the right direction. Spend time going inward, reading the books of your soul and re-discovering the knowledge within your being. There is knowledge within you. This knowledge is your guidance, the guide that truly works for you. May you be blessed and may your manifesting power open up to the truth within your being! Thank you for explaining this so clearly. It is really amazing to find out what we are able to do and what we can do to really take action. Thanks so much for channeling this information and thanks M for posting this question. I have been feeling the same way about the LOA and now I have a better understanding. WOW! Thanks so much for this clear explanation. This message was so valid to my life.